I know this is not technically correct, but thinking of it this way helps me visualize what I am trying to do with these settings. "This one has to be set high and this one low, this one is dark and that one is light." But as I picture it, this is the way it works. Volume is like your muscles beneath your skin. Setting a higher volume scale is like setting the power of your muscle tissue to shine its way through your skin, like when you put a flashlight behind your hand and you can see it shine through. The stronger the flashlight, the more you will see it. So choose a color and strength that will show through the skin (the glossy-translucent settings), but still look natural Don't choose a red color like your actual muscles, but instead choose something more like a darker version of your actual skin color. And don't forget to enter it as a reversed color. Red reversed is cyan, Green reversed is magenta, and Blue reversed is yellow. So Caucasian flesh color, which is orangey-pink (red and yellow and white), which reversed would be cyan and blue and black. That means a darker cyan-blue makes a pale peach. I know the documentation says the parameters are not related, but you can definitely see a correlation between the glossy-translucent absorption and volume absorption whenever you change either setting. The glossy translucent absorption (GTA) parameters are like your actual skin. They represent a coating around the volume. The lower the strength of the GTA, the more of the volume effects will show through. Likewise, if your volume settings are too low, you will end up with a pale, washed out skin. So choose a GTA that approximates the actual color of skin you want and don't forget to enter the RGB values as opposites of the RGB values of your actual chosen color. As for the GTA scale, smaller values will appear as paler versions of your GTA color because the "skin" is thinner, therefore reflecting more light than it absorbs. Thicker scales will absorb some of the light, bringing out the more true value of the chosen color, while at the same time reflecting light back out through the skin giving it that waxy, translucent look. Find a balance between thickness (scale) and color or you will end up with white tips on the end of the nose and the ears! ;-) I think of the scale settings in terms of centimeters, though that is not technically correct. Human skin is, at it's thickest, about 4mm or nearly 1/2 centimeter thick. So, keep this setting in the .3 - .5 range. A little higher if you are going for an effect. As for scatter, the scale should be similar to, but not necessarily the same as, volume absorption scale for the same reasons. You want the scattering effect to be visible through the GTA, but not overwhelm it. Here is where I would choose a color with more red in it, since the blood vessels under your skin are flowing with red blood, which contributes to the color of the light scattered under your skin. That said, don't make it literally red because the tissues in your skin are also contributing to the light color being scattered. I like to choose a reddish brown. This way, you get the redness from the blood, but also the brown of the melanin in our skin. Too much red and you have a sunburned Vicky! If your character is particularly pale, such as a vampire or albino, then you can go for a bluer tone, more likely purple or lavender so that some red is still present. This color does not have to be reversed. It is a direct color because there is no absorption involved. I think of the scale for volume in millimeters (cm for skin, mm for volume). My body is about 17" wide viewed from the front, which is 430 mm. So, I set my volume around there. Guys like the Freak are big, so I went to 500 for him. Females and kids might be around 10" to 14" wide, so 250 to 350 is a good place to start for them. Again, nothing scientific about most of what I wrote here, it just helps me to think in these terms and seems to work. A few of the stats I listed actually are scientific (at least according to Wikipedia) like skin thickness, etc. These are good starting off points for you, at least. Also note that human skin has an index of refraction (IOR) of 1.45, so set your volume and specularity IOR's to 1.45. I hope my theories help someone. I am very sleepy right now and may have rambled a bit and for that, I apologize. Also, thank goodness for spell check, because sleepy people should not be allowed to type. I like it I like it a lot. I'd love to see a more finished version. I think the skin tone is much more realistic now. Like I said I wasn't very happy with my results but I like what you've done with it. Most of the range of data I used came straight from .lxs scene files that was auto-converted from UbS2. Not saying one set of data is right and the other is wrong, just stating where I got the info from. Info I've found on the web on the IOR of human skin varies depending on who did the test. Range seems to be between 1.36 and 1.44 in the sources I've seen. Guessing that in the real world the value does vary between different people. Are you going to make adjustments to your image similar to the ones I suggested and re-render? Or are you putting this one on the back burner for now? Its very generous of you to share the scene. Weird thing is, its working now. I can't issolate what is the difference between my scene with your settings and your sharecg scene. They totally look the same. Its rendeing slightly yellow, but making minor adjustments looks fine. I'll try some more things to see if I came up with what's happening. Made some minor adjustments to the color space and set Areal Light.Default to 2 to make it closer to yours. Now, off to see whats going on. This is just crazy! I can't understand how NO ONE has been able to duplicate my results. I don't know, I thought what I got was pretty similar. I'm glad to see Hellboy's is working now too. I'll download the scene file just to compare though. Yeah, yours was the closest match, but still looked "burnt". I hope we can figure out what the difference has been and if Hellboy can repeat it on one of his characters, we may be able to solve it. That's just because my guy was crouched lower, away from the lights, and I didn't adjust them. The test scene renders perfectly. I'm loving the lowdiscrepancy sampler. Such an improvement on render times. Actually, mine is redder there. It may be down to what Daylight you're using. This looks a bit closer to the color. I suspect the difference is just gamma or other color space settings. Plus I haven't run mine long at all. I'm trying the settings on Sol Elite, lowered the absortion and scattering scale to 1 and Sol's specular maps are darker, so I made the specular color lighter, however I see no difference, I'm using white now, which usually would give me am unusuable highlight, but the skin still looks almost matte and very warm. And the skin is granulated and taking more to render, as it happens with very shiny materials. For the specularity issue, if you are using IOR on spec channel, changing the spec color will not make any difference. The IOR automatically sets the spec color to mid-gray. Either lighten the spec maps in another program or remove the IOR. I also tried this with Elite Sol (one of my favorite textures). I wouldn't lower the absorption and scattering scales to such a low number. Nothing under 100, really. If his skin is looking too saturated with these settings, try lowering the glossy-translucent absorption scale. I think the Freak file is set to 1, but realistically you want between .4 and .65 or so. Also, because his texture is already a bit more saturated, you might try desaturating the glossy trans absorption color, or lightening it. Easiest way to do this is to lower the "S" slider for saturation or the "B" slider for brightness in the HSB section of the color picker. Remember for making absorption colors brighter or darker, you do the opposite to your entered color, so lighter tan equals darker blue, etc. Let me know if this helps! It seems to me that I must have been using some setting on my computer that I forgot to tell the rest of you about. Not sure what it could be, but apparently when you opened my scene on your computer, it flipped that switch. I am happy to know it, but would really like to figure out exactly what it was so I can include the instruction in future tutorials. As soon as I have ironed out all of the details and can start a scene from scratch and know almost exactly what I need to do to set the skin, I will be writing an in-depth tutorial. I am so happy to see all of the freaks showing up in this thread. Now, to see how it applies to your own characters. Hellboy, I know you like to use Hyde a lot, so I am looking forward to that. I honestly didn't even know such a character existed until now. Could one of you send me a scene file from an earlier render on this thread? I want to compare it to my settings and see if I can get to the bottom of this. Please make sure the file was saved prior to having downloaded my scene file. If my scene file changes a setting in your render settings, I don't want the file to have been re-saved with the change in it. Know what I mean, jelly bean? Here is the latest and greatest. David 5, Sean texture. No cotton balls in the right ear this time. Funny, since buying David a few days ago, this is the first time I have tried anything but the default texture. Love the Sean character. I also tried to get a little more into setting up a real scene for Lux. I used displacement, changed all the mats to Lux, created missing bump maps, everything. I'm finally ready for my big boy pants. Hope you like. 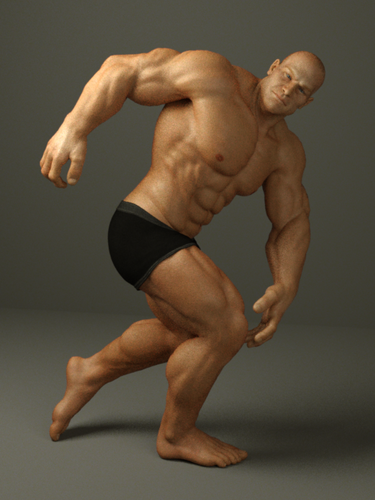 Rendered for 1:38, only 96 S/p. I love the lowdiscrepancy sampler! Only thing is, it probably won't work well when I start adding glossier surfaces such as glass or metal. I will cross that bridge when I get my car fixed. Edit: Took out the lowdiscrepancy render and put in my metropolis render. Only 3:20 render time, but I can't see anything in the pic that cooking overnight is going to improve. It looks the same now as it did after 1 hr 30 mins. Just 3 sparkly speckles, which I took out in Photoshop. Only postwork was his eyes were too white/bright, so I toned them down in Photoshop. Thank-you. I am setting a render before bed using metropolitan sampler, just to see if the difference is worth the extra long render times. It has only been 8 minutes, but I can already tell you that the catch light in the eyes is already so much nicer in the metropolitan version. It very well might go away as the render continues, but I like it right now. I only wish the flame on the torch behind him would backlight him a bit more. The metro render shows more of the flame shining through his ear, which is nice and realistic. Pausing to look at the rendering after typing that last sentence, I can really see a great deal of details coming out in the metro render that are lacking above. I almost wish I hadn't done this comparison, because metro is winning out even after 10 minutes. Nice job Slosh, gotta use metropolis and either bi-directional or path really to the best results. Mine is almost done as well, mucho thanks for figuring out the glossy translucent with volume. I like your David pic. In #2, it looks like either his GTA (glossy translucent absorption) scale is too high, or the bump is too high. If you left the Freak settings on, which had GTA scale at 1.0, this will be your problem. Lower it to .4 as a good start. Make sure the bump maps are not higher than 0.002 as well. Maybe 0.003 at the most. Is that Michael 4 in your pics? Just wanted to let anyone and everyone know, I updated the file on ShareCG so that it will load Genesis Male instead of Freak 5 and it will load default Jeremy RR textures instead of Andrei. Keep in mind that the Jeremy textures are only 1024x1024, where Andrei is 4000x4000, so the results are not going to be beautiful, but it is a good starting point. Change the volume absorption scale (VAS) and volume scatter scale (VSS?) to 250 for nicer results with Genesis Male. The scene file still has it set at 500. It was the bump map setting. Thought I had set it lower that it was. Will be back with pics later. Character is Freak5 using the Andrei character morph. Looks good, InaneGlory. I think I like the #2 best, which you said was your preferred settings. I know it's a matter of personal taste, but I feel like something needs to go deeper. Your scattering scale of 4 really will not make a dent in the volume. I am currently running some tests trying different volume strengths while having no textures applied to the model so that I can see the pure color changes. I used a green color for volume absorption (which is actually magenta in the settings), then slowly increased the scale until my volume looked green. This never even happened until I reached 150. Then, I set the scatter to an obnoxious bright blue and adjusted the scale until I saw blue scatter. Again, this didn't appear until higher numbers were reached. I ended up deciding that setting both to 100 gave me the best starting point. Once I added the textures back in, I found that I needed to go to 500 to really see anything through the texture, and this is on a pale Aiko 5 skin. Wish me luck! And again, number 2 seems to be the way to go. Decided to try a female texture this time. I spent about 4 or 5 hours fiddling with volume and glossy translucent settings again, trying to unlock the mysteries. I started with the model completely texture free (just white), then added the glossy-translucent with volume to all body and head materials. I did a render, which just looked like a body made up of tiny dust particles. I then colored volume absorption to a very obnoxious green and started increasing the volume absorption strength until my volume looked more solid and had the green color visible. That was at about 150. I then did the same with volume scattering and a bright red color. Again, 150 was the magic number. As soon as I changed the volume absorption color to be more flesh-like, the effects on the volume were no longer visible. What I discovered is, depending on the color of the volume you are going for, higher or lower scale settings would be needed. I ended up settling at 100 for both the absorption strength and the scatter scale. But, this would not last for long. As soon as I added the character textures to the diffuse channel, the scattering and volume absorption were not strong enough to be noticed. I increased them both to 500 but that was too much. Final setting, 100 for v. abs scale, 250 for scattering scale. I put the texture map in both the gt-diffuse and the gt-transmission channels, with the color at RGB 225,225,255 to prevent blowout. For specular color, I was using a pretty specific specular map, so I decided not to use IOR but instead rely on the specular color and the roughness settings. 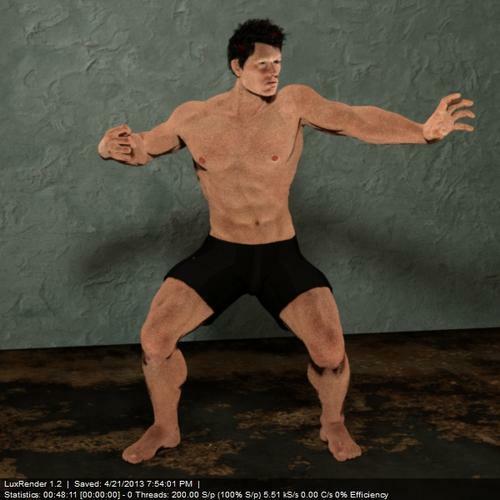 Bump maps were set to strength of .001 on the face and .002 on the body. I experimented with increasing these amounts, but even the slightest increases were too extreme. Finally, I added in the glossy-translucent absorption. I tried darker colors and lighter colors, as well as colors that would not come out as flesh, but finally settled on a medium blue. Different depths were tried as well, but again .40 seemed to be most appropriate for my girl. I then spent a lot of time working on the eyes, which came out really good in tests, but I think might be too shiny in the attached image. I was surprised to see how chapped her lips look, so I will have to readdress that in my next testing session. So, all that being said (I talk too much) here is my attempt at female skin. BTW, I used Bree for V5 as the texture. Here is a render with my eye settings. 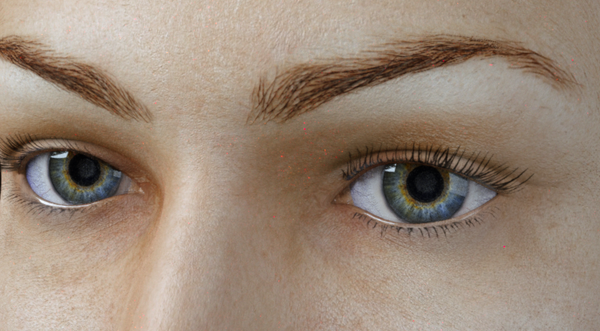 The grainy area in the sclera is caused by a custom absorption map that I made, which clearly needs to be worked on. I didn't realize it was so grainy until I let this close-up render. Did you post those eye settings and I just missed it? They came out looking pretty good. I haven't posted the eye settings yet. I actually just came up with them early this morning. I would like to iron out a few of the rough spots, no pun intended, before putting them up. Also, try them in a few more lighting situations with different texture sets. Just to make sure that this render is not the only one that will look good with these settings.